This is where it all began. My very first record player. I got it for Christmas when I was about four or five. Now I could listen to my records anytime I wanted to and believe me, I did. I took this Fisher Price record player everywhere, but more importantly, it was this little machine that enabled me to play radio. I would put my 45s on the turntable and talk up the records just like I heard my favorite DJs do on the radio. It was here, at age 5 that I knew what I wanted to do with the rest of my life. 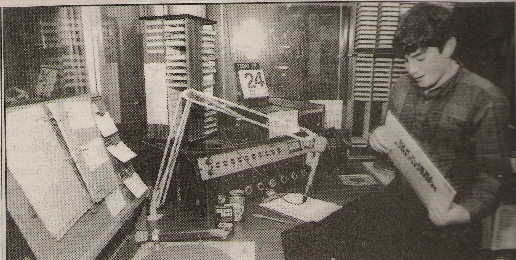 My radio career began at WBMT-FM 88.3 in Boxford, MA. I was 13 years old. I hosted a show called "Friday Night At The Oldies" from 6-10pm every Friday Night. The show ran from January, 1989 until June of 1994. See the Friday Night At The Oldies page for more info on this show. WBMT is a community radio station that's still in operation as part of the Masconomet Region School District. It was here that I learned what worked and sounded good and what didn't. I wouldn't be anywhere today if it wasn't for Glen Walker, the general manager of WBMT for giving me a chance to open a mic and discover what came out. We all have to begin somewhere and it's really too bad that everyone can't have access to a radio station like this to start out on. Where's the radio talent of the future going to learn how it's done?